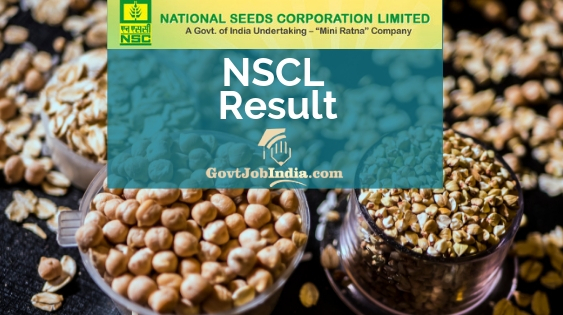 NSCL MT Result 2019- National Seeds Corporation Cut Off and NSC Merit List @ www.indiaseeds.com | Know your India Seeds Recruitment Result Score here! NSCL Diploma Trainee Result 2019- All those candidates who wish to know their National Seed Corporation Result are hereby notified that the NSC cut off and Merit List will be published by the National Seeds Corporations Limited very soon. After successfully conducting the written exam, the organization will now evaluate and mark the contestants who appeared for the test. If you were one of those who appeared for the recruitment exam, then you must already know that the next stage of the recruitment is the interview and all those whose names appear in the NSCL Selected Candidates list will be called for the interview. The NSCL recruitment was conducted for the posts of Deputy General Manager (DGM) (Vigilance), Assistant (Legal) Grade-I, Management Trainee, Senior Trainee, Diploma Trainee, Trainee and Trainee Mate. If you were one of those candidates who applied for the NSCL Recruitment and has some doubts related to it, check it out here. NSCL Result will consist of the Merit List, Cut off Marks and the waitlist. All those who wish to know their result should keep on reading. How to get your National Seeds Corporation Result 2019 Online? When on the website, the Result will be there in the official homepage. Click on the link. When the link loads, enter your date of birth and other required details and click on the submit option. Your NSCL Result will be on your screen. We hope you got good news! As The NSCL Cut off Marks is the least score you need to secure in order to get selected for the recruitment, it is obvious that all those who score below the criteria of marks will be disqualified from the recruitment. As of now, the NSCL MT Cut Off marks has not been declared yet. These marks are quintessential for the recruitment process because each category has different cut off marks. Compared to the general category, the reserved categories will see a lesser limit for the selection procedure of the recruitment. Meanwhile, we have attached the NSCL expected cut off. This is the last years cut off and will give you a general idea of how much these years cut off might be. As you might know, the cut off will be based upon the following factors. These are given down in the section below. Those candidates who clear the recruitment exam by getting above the NSCL cut off marks will feature in the India Seeds Recruitment Merit List. This selected candidates list will be in rising order of the names of entrants who have scored more than cut off marks. If your name features in the merit list, you have been selected. Congratulations! We sincerely wish that you get selected for the National Seeds Corporation Limited Recruitment. Hope you found this article about the NSCL Result 2019 useful and informative. Comment below if you have any doubts related to the NSCL Cut off and merit list and our GovtJobIndia.com Team will get back to you as soon as possible. In conclusion, subscribe to our website @GovtJobIndia.com for latest updates of recruitment across the nation.